And if it’s OK to use dogs why not chickens? Item #2. They aren’t fried but they certainly are half-baked if you ask me. 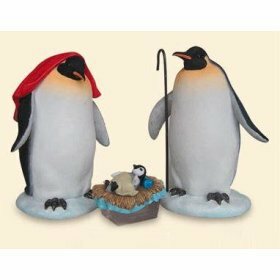 When I saw this Item #3 my first response was, “Watch me pull a Wise Man out of my hat! 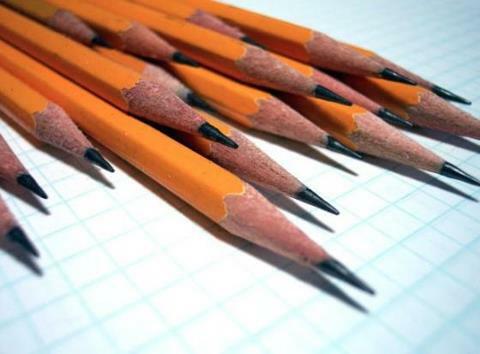 All of these first few seem rather busy – Artistically speaking. I prefer something more Minimalist – with simpler, cleaner lines. Such as Item#4. 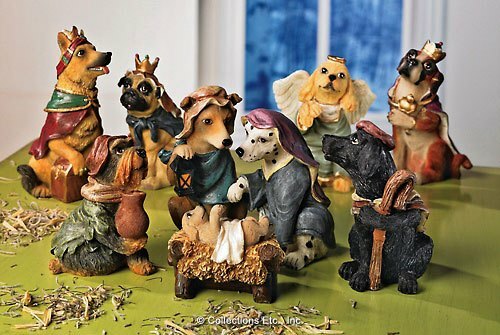 My personal favorite among the all Animal Nativity Scenes is this one. I’m not sure what they were aiming for or if it was just a spur of the moment thing – Item #5. When some of the “Artists” decided to create a new family heirloom I truly do think that their first purchase was at the local liquor store instead of Hobby Lobby. 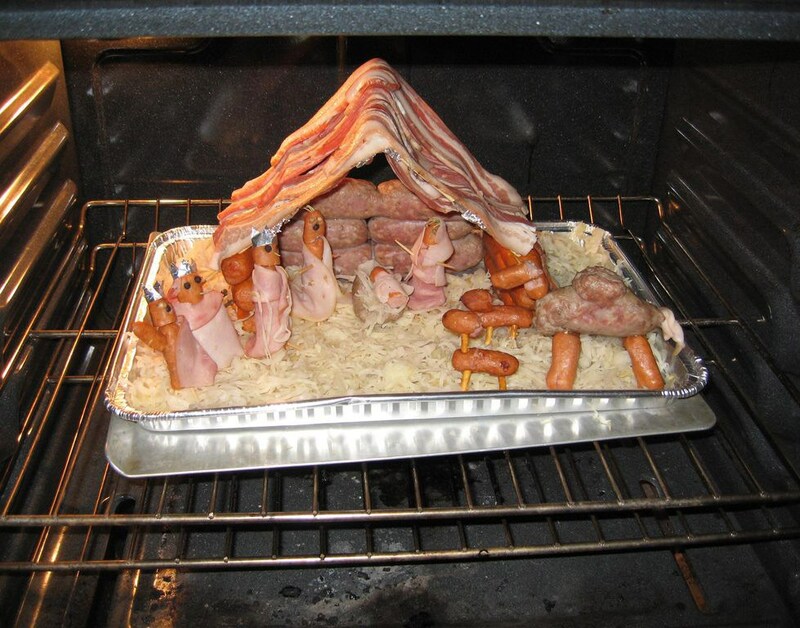 Unless you are Lady Gaga I don’t understand the inspiration for Item #6 – The All Meat Nativity. 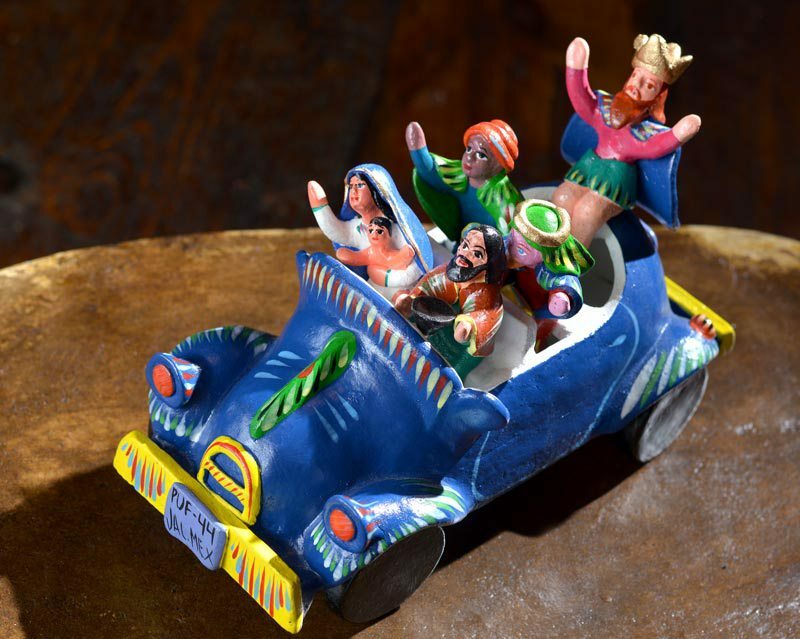 I’ve decided to call Item #7 the “Bethlehem Hillbillies Nativity” with everybody piled into the family jalopy headed to the Mideast instead of Beverly Hills. They must be counting on Divine Protection since nobody is wearing a seatbelt. 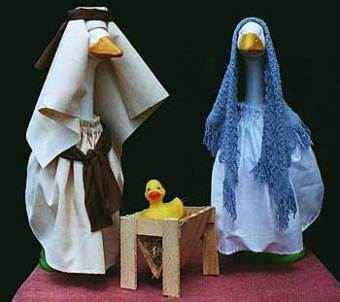 I seriously think (I do that sometimes) that the person who makes their very own Nativity often uses whatever materials are handy. 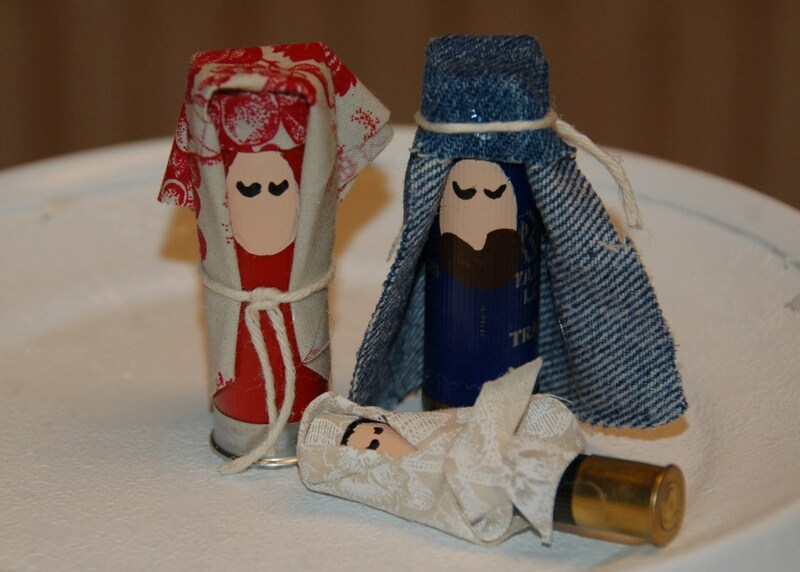 I’m sure that is the case for the creator of Item #8 – The Nativity made out of Shotgun Shells. For Item #9 it must have been a case of “It’s due today and I haven’t started yet” mode. They grabbed the kid’s Scrabble game and went to work. Voila! A Super Minimalist Nativity! And it’s worth 47 points! 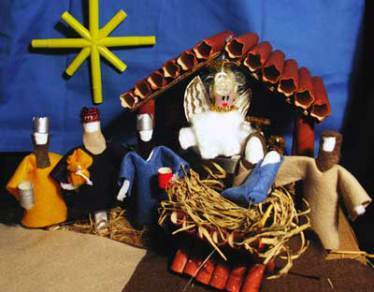 Now I have to admit that Item #10, at first glance looks very traditional, but it is the very first Nativity Scene I have ever seen constructed from tampons. I also hope that it is the last one I will ever see so constructed. I’m sure that some of these things were made to be sold commercially. 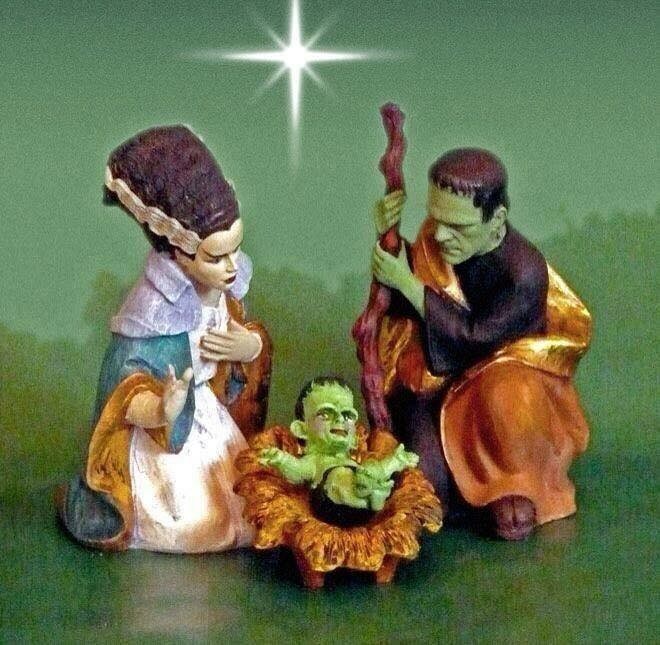 Someone, somewhere said, “Let’s make a unique Nativity Scene and then sell them all over the world.” It’s a fine idea and somewhere in China or North Korea there is a factory cranking out hundreds of thousands of Item #11, my personal favorite – the Frankenstein Nativity. This one is not a “do-it-yourself at home” job. This was planned. 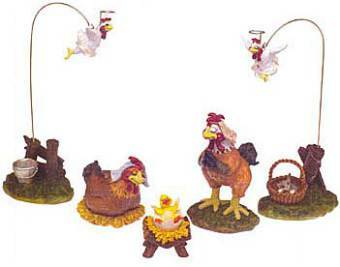 I bumped into these things at an internet site recommended by my wife, the Lovely and Artistically Astute, Dawn. Here is the link if you, for some reason, want to look at 77 of these things and ruin your appetite. Many thanks! This exactly what I needed. No words needed, just a fork.